During the fifties, Berkel was not just an innovative manufacturer of meat slicers and similar equipment for the preparation of food, but the brand was a real Status Symbol: in fact, the world over, only those grocery stores that owned a Berkel were considered really excellent shops. The Berkel meat slicer gave meaning to the following motto: “Buy the best and forget the rest"
This motto is still valid today, thanks to the precise mechanics and the great quality of the final sliced product. But also thanks to the attention to detail, the beauty and the extraordinary aesthetical quality of the Berkel meat slicer. Even some 110 years after the company was founded, the name Berkel is still synonymous with slice perfection, safety, hygiene, innovation, style, reliability and long-lasting performance. 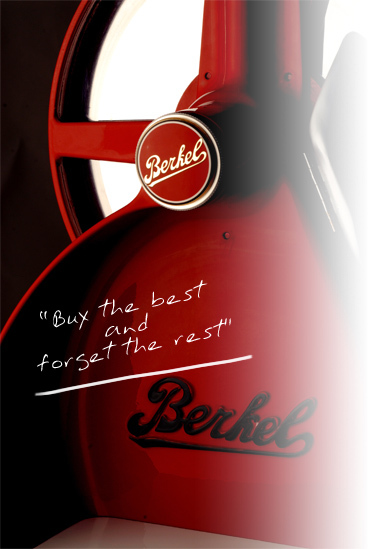 But Berkel also means much more: it helps the customer and treats him/her well and so guarantees a total peace of mind, the best results and maximum economical benefit. This fundamental principal has been proudly handed down through the generations till today and can be summarised in one simple word “Berkelism”.